Dr Zhang started to research on the neural basis of high level cognitive process when he was a graduate student. 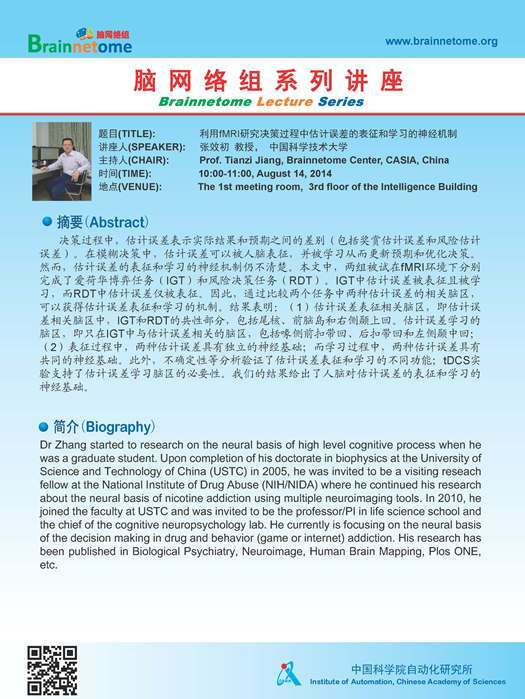 Upon completion of his doctorate in biophysics at the University of Science and Technology of China (USTC) in 2005, he was invited to be a visiting reseach fellow at the National Institute of Drug Abuse (NIH/NIDA) where he continued his research about the neural basis of nicotine addiction using multiple neuroimaging tools. In 2010, he joined the faculty at USTC and was invited to be the professor/PI in life science school and the chief of the cognitive neuropsychology lab. He currently is focusing on the neural basis of the decision making in drug and behavior (game or internet) addiction. His research has been published in Biological Psychiatry, Neuroimage, Human Brain Mapping,Plos ONE, etc.